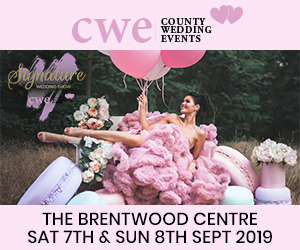 County Wedding Events are proud to announce its two-day Signature Event at The Brentwood Centre - one of the largest and best wedding shows ever to be held in Essex. It will be the ultimate wedding shopping experience for Essex couples as well as couples from surrounding counties! Houchins is a Grade II listed farmhouse exuding elegance and charm with wonderful converted barns designed to make your celebrations flow seamlessly throughout your special day. The venue is licensed for civil ceremonies, with both indoor and outside options. There is a choice of reception areas for eating, drinking and celebrating alongside superb gardens and terraced areas. There is luxury on-site accommodation for you and your guests to relax in peaceful surroundings at the end of the day. Come to the show to view the venue and discuss your plans with wedding suppliers exhibiting on the day. Set in tranquil, picturesque gardens, Greenwoods Hotel & Spa is the perfect blend of traditional and modern. With a choice of reception suites and licensed for ceremonies, the venue is the ideal location for both small, intimate weddings as well as larger celebrations. Guest accommodation available as well as relaxing spa facilities in the hotel. Come along to view the venue and discuss your plans with wedding suppliers exhibiting on the day. County Wedding Events proudly announce its Signature Event - one of the biggest and best wedding shows ever to be held in Surrey. Located next to the Mercedes Benz race track with viewing platform, simulators, exhibitions and children's play area, as well as cafes for refreshments, the venue is certainly a wedding show like no other! Entry to the show will be FREE. All couples attending will be given a goody bag, including a copy of one of our glossy County Wedding Magazines. We offer every couple attending the opportunity to enter a competition to win a luxury honeymoon plus the first 100 couples each day will receive a FREE Wedding Keepsake Diary. Stifford Hall Hotel is an elegant hotel full of the grace and charm you would expect from an 18th Century Georgian manor house. Set in six acres of landscaped gardens, the hotel is a perfect setting for your wedding day. The venue offers a choice of beautifully restored suites, perfectly suited to both more intimate gatherings as well as large celebrations. The venue is also licensed for civil ceremonies and has luxury overnight accommodation for you and your guests. Come along and see our beautiful venue dressed for a wedding and talk to our events team about how we can create your perfect day. Our Caterers will be there to answer all your questions and with some delicious canapes to sample. Enjoy a glass of prosecco whilst you wonder round the venue, its stunning grounds and all the beautiful bedrooms. Our Wedding coordinators will all be on hand to answer any of your questions and to help visualise your perfect wedding day at That Amazing Place. Local Suppliers will also be there showing their work and to make contact with. We look forward to seeing you there. Experience the beauty of how your wedding day could look. Our drawing room will be dressed for a civil ceremony and our garden suite and garden gazebo will be fully dressed as you would expect on your wedding day. Our luxury bedrooms within the main house and garden wing will also be available to view. Our events team will be on hand to offer tours of this amazing venue and answer any question you may have. With weddings packages available from just £3,999 this is one open morning not to miss. This is a free event with a glass of bubbly and canapés on arrival, with no booking necessary. Here in our beautiful seaside venue, we understand that every wedding is unique. That's why we aim to create a bespoke wedding package for every couple. Although each wedding is different, one thing remains the same, and that is the support from our wedding team, who from your initial interest call, to your first dance, will be there to make your dreams come true. To picture how your dream wedding will unfold, we have monthly open evenings, where we welcome you to visit our beautiful Venue. Our Wedding team will be on hand to discuss any requirements you may have for your big day. No wedding would be complete without attending one of the Essex Wedding Exhibitions. You will meet the best wedding suppliers in the area. Visiting one of our exhibitions allows you and you wedding party to experience what the internet cannot offer. Taste a sample of the wedding cake, hear live music, talk to wedding suppliers face to face, sit in a vintage car, feel the fabric of the wedding dresses, try on tiaras, have a make up trial, be entertained, whilst gaining hundreds of wedding ideas, tips and inspiration. Essex wedding exhibitions are also the place to find one-of-a-kind show specials. Many of our exhibitors offer booking incentives and special discounts not found anywhere else. Whether your wedding is large or small, you'll find a wide range of wedding suppliers eager to please a variety of tastes and budgets. There is so much to discover at our exhibitions, you could literally plan your entire wedding in one day! Planning a wedding? Then a visit to our FREE wedding exhibition, on Sunday 15th September is a must! Meet the best wedding professionals without driving all over town! Whether you are browsing for inspiration or ready to make final choices, we know how important it is to be able to feel the quality, ask the questions and meet the people who can make a real difference to your wedding plans. The specialist exhibitors are carefully selected to cover the full range of wedding services because they share our passion for creative design and fantastic service. An absolute must for all those planning their perfect wedding. A unique and glamorous shopping experience, with a vast range of exhibitors waiting to help you with your special day. Taking place at one of the most sought after and beautiful venues in the South-East, with over 18 years' experience and a well-earned reputation for the excellence of its Wedding Fairs. To exhibit at our spectacular Wedding Fair, please contact 01702 203701 without delay. View the excellent facilities of this lovely newly refurbished and equipped community hall, adjacent to an award-winning park. New octagonal dance floor, stage, bar area, commercial kitchen, car parking. Also, engage with a variety of wedding specialists, catering for your every need, to make your special day even more memorable.